How does technology play a role in end times Bible prophecy? On the March 25th edition of the radio program Prophecy Update, I was interviewed by Bill Salus, author of the popular Psalm 83-themed book Isralestine and evangelist on the end times website Prophecy Depot. Bill and I spent much of the interview discussing how technology plays a role in end times Bible prophecy. Bill Salus: Today we're going to be talking about Nathan's special area of expertise — technology in the end times. Nathan is the Web Minister at Lamb & Lion Ministry and in his role uses a variety of technologies in proclaiming the soon return of Jesus Christ. What are some of those technologies? Nathan Jones: Our primary outreach over the Internet is our main website at www.lamblion.com. You can remember our Web address in that Jesus came first as a lamb — as a suffering servant — and He is coming back as a lion — a roaring King. That helps people remember the order of our ministry and domain names. On our website we have tons of articles. You can watch online our TV show "Christ in Prophecy," as well as on our YouTube and GodTube channels. I think I last counted over 130 some episodes in which you can watch. We also podcast, which is listening to our sermons, shows and interviews by mp3 on your iPod or mp3 player. We also have a blog called The Christ in Prophecy Journal. I even Twitter to give updates on Bible prophecy. We also offer a Facebook group where as of now there are over 4,000 people spending time there talking about Bible prophecy and lifting each other up. This outlet has especially been a blessing to people in countries where there is no real solid churches and there is no real way to share in their love of Bible prophecy. They get to do that through the Christ in Prophecy Facebook group. Those are some of the technologies we use in our outreaches and are the places to go if you want to reach me with a question about Bible prophecy. On our website, just click the Contact button. Also, you can contact me via Facebook if you are part of our group and you can leave questions or comments on the blog as well. I will answer the questions or for Facebook we have some really dedicated and very knowledgeable volunteers who can help and answer those questions. And so, I invite folks to come to www.lamblion.com and get to know us and more importantly Jesus Christ. Bill Salus: I go there quit frequently. Nathan and I exchange emails a couple of times a week I would say. We share and brainstorm on important end time prophetic topics. Bill Salus: The prophet Daniel in Daniel 12:4 was told, "But you Daniel shut up the words," regarding end times prophecy that he was given that alarmed him concerning the Jewish people. "Shut up the words, and seal the book until the time of the end. Many shall run to and fro and knowledge shall increase." Now, I know that with Lamb & Lion Ministries, Nathan, that you are involved in technology. You are talking on Twitter and Facebook and technologies like that. Do you think that when we read Daniel that in there some reference could be found concerning end time technologies like the computer and the social networks? I'm talking about knowledge which can be disseminated out on a wide massive scale. Do you think that might be hinted in what is being said there in Daniel 12:4? Nathan Jones: When I went to Bible college and then to seminary, I used a typewriter to get through and do all of my papers. As I got into missions work and wanted to get on the mission field, I learned computers and eventually went to Tech School and learned Web Development. Those new technical skills opened up a whole new world to me about how we can give the Gospel to people around the world. I'll give you some statistics. In the United States, almost 80% of the people use the Internet right now. 80%! In China in just the last three years, that statistic went up from 10% to 29% of the 1.33 billion population of China who are using the Internet. Overall, we can reach a third of the world over the Internet through computers and cell phones, and now tablets which are getting more popular like the iPad. The way to get the Gospel out is unprecedented, and that is on top of radio and television and communications we've had like satellite. It's just amazing! The people who I deal with every day on my mission field are people from all over the planet. I'll give you one example. I once had a teenager from Saudi Arabia who wrote in and wanted to know the Gospel, but he wrote that if anyone in Saudi Arabia found out that he was checking up on Jesus that he would be killed. So, we were able to use that technology to give him the Gospel. I have people in England and South Africa who write in saying there are no good churches in their countries. The church is almost dead there. It is like less than 1% evangelical in the UK. One of our visiting people from South Africa wrote, "You are like my church because this is the only way I get to share fellowship with other Christians and get a good solid dose of the Gospel." The technology is there to reach people. We talk to Atheists and Muslims and cults all of the time and get to share the Gospel with them. People trip across our website or we go out with the e-newsletter people can sign up for on our homepage that someone has forwarded to them and that brings them the Gospel, too. So, yes, I would agree that when the angel was telling Daniel to go his own way, something like "Sorry, Daniel, you just can't understand the end times now, but when it gets to the point when people travel incredibly well and they go to and fro around the planet, then it would be understood." We have the very technology to do that. I mean, with the concord jet, it used to take just an hour or two to get from Europe to the United States. And, we've got the ability now to get the Gospel out all over the world. I believe it was a year or two ago that the Billy Graham organization decided that since they saw the signs of the end times were coming that they'd devote their technology to a whole year of getting the message of Bible prophecy out. Bill Salus: Do you know what is amazing, Nathan? I am astounded when I write an article or something and I'll find out that it got picked up on say Joe's blog site. I don't know if there is a Joe's blog site, but in other words, these are just free blog sites that people pick up from Google and Blogspot or whatever. Just Google "free blog spots." I have used them before and that is how I started with my ministry. Well, they are grabbing up my articles and they are posting them. Now you throw in Facebook and Twitter and you can take and get this information out and you don't have to spend a lot of money in putting something like this together. It's all pretty much free isn't it for the novice? 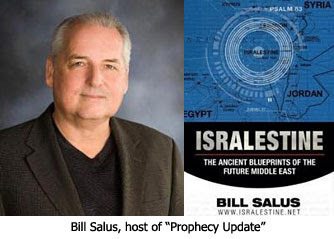 In the next segment of this interview with Bill Salus concerning Bible prophecy and technology, we'll look at ways how anyone can share the Good News over the Internet. Hello Nathan, as whe know , blogger, twitter , youtube , facebook and so on, help spreed the Word of God, Aleluya, technology in the end times is helping a lot!! Maranatha!! Modern technology is the end time equivalent of the well built Roman roads that aided the quick spread of the Gospel across the ancient world. For Instance, The Question: "Is America mentioned in prophecy?" - has been unequivocably answered in the affirmative. Moreover, "The Ten Lost Tribes of Israel" - have been painstakingly identified through the scriptures... and very soon, they'll be returning to The Promised Land.